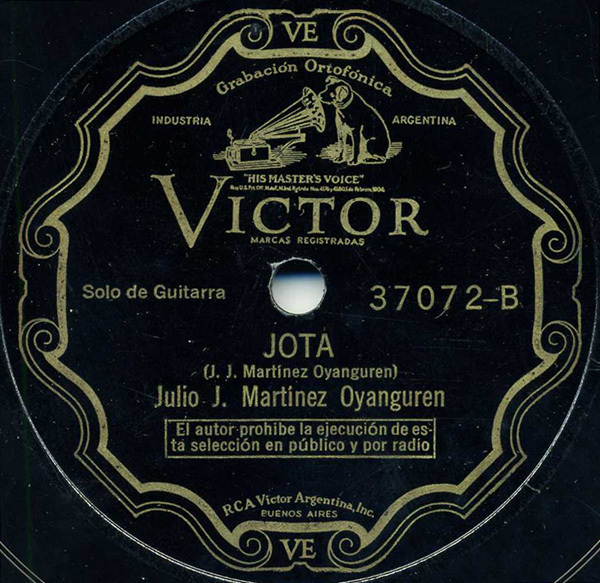 Oyanguren began recording for Victor in Argentina in the early 1930s. This piece was recorded in September of 1931. His career lasted decades (he also recorded a number of 78s for Columbia records around the same time), he toured internationally, was respected and well-known, and released many LPs. This original piece, however, does not appear to have made it to CD. Numerous other performances by Oyanguren (and many other excellent artists) can be found at Fine Fretted. This track was a tough one to remaster (I had it sitting on my computer for months), despite the fact that it’s a shiny, beautiful copy. Victor Records in Argentina gave us an exceptionally “low” recording of this song and an iffy pressing – the more quiet the music, the more loud the classic, grainy Victor surface noise. I gave it my best shot. beautiful song. i wonder if it would it be possible in the future to post both versions of a song; the original, unmastered version and the remastered one? i really love your blog. thanks for the great music. oh, i must say i much prefer the unmastered version. it feels more alive. thanks for posting it. Well, I respectfully disagree, Tom. While I am not a professional at audio cleanup, the “aliveness” you might be hearing might be the fact that you’re hearing a mono recording in stereo – therefore, double the noise. It definitely creates the illusion of being more alive. I ALMOST never use “noise reduction” when cleaning up tracks. I, too, believe that is an enemy of old records. My cleanup techniques, 90% of the time, have little to do with removing “noise” though, again, I nowhere claim to be a recording or restoration engineer. That said, I will not stop from cleaning them up. You mean Phil Schaap, correct? Yes, I have read that article, and I would agree with his stance. – I could have done without the Segovia tracks! Great pre-nylon string era music – good old catgut! Wonderful to be introduced here to one of Oyanguren’s own compositions I hadn’t heard before. I love this guy! JMO is sort of an undiscovered treasure – a classic, South American touch and, like you said, he really nails it with his arrangements of the folkier pieces. That collection of his, “Latin American Folk Music” (Decca – on 78 and lp), was, decades ago, my introduction to solo guitar arrangements of South American melodies. Oyanguren did a recording on Columbia entitled “Spanish National Airs”, two sides of a 78, which is an elaboration of this piece you’ve posted. It’s interesting to hear what he does using this melody and basic I-V progression as a cornerstone, then tearing it up, going this way and that. A wealth of great guitar playing came out of the Rio de la Plata region, Montevideo, Buenos Aires – Segovia spent time there. You’re doing a great job, and a great service, by the way.